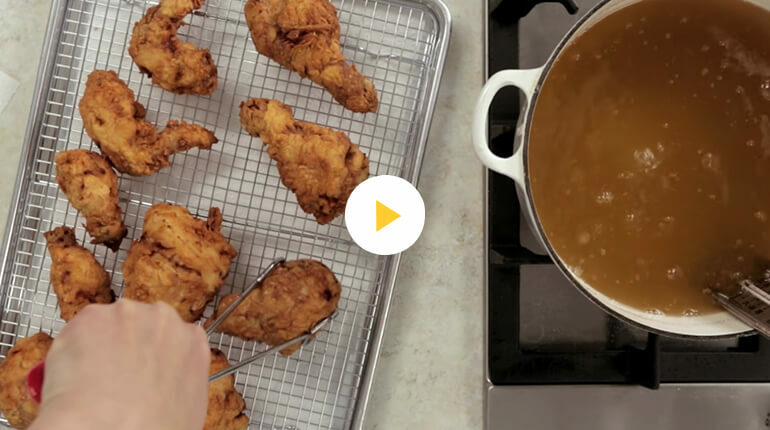 How To: Fried Chicken When only fried chicken will do, here's how to do it. When only fried chicken will do, here's how to do it. Smoke point is the temperature at which oil or fat burns. Choose an oil that can be heated to 365°F or above without burning. The oil you choose will enhance the overall flavor. When oil burns, it releases free radicals and chemical compounds that make chicken taste bitter. Burnt oil can also make fried chicken's crust appear "done" while the meat is still under cooked. Avoid oils with a low or borderline smoke point such as extra virgin olive oil and coconut oil. Test the oil with a deep fry thermometer—heat up to 375°F. Fry in batches; overcrowding the chicken will lower the oil's heat, leading to greasy chicken. Replenish the oil if needed. Give it time to heat back up to the correct temperature. Check chicken temperature with an instant read meat thermometer. Don't mistake a brown crust for done chicken. Always wear an oven mitt when working near the oil. Hot oil splatters and can cause severe burns.